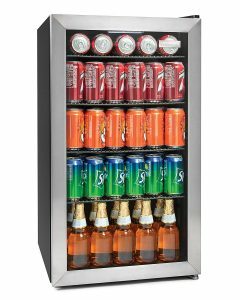 Igloo IBC35SS is a 135-can and 3.5 cubic feet capacity stainless steel beverage fridge and cooler with a tempered double-pane glass door. It is rated 4.5 out of 5 stars on the day of this product review but there aren’t many ratings yet for this brand new release beverage cooler. You have the option to purchase the 180-can capacity IBC41SS model via the same page. That one costs roughly 80 dollars more at the moment. The capacity for both models is “up to” 135 or 180 x 12 ounce size cans. And it will depend on how you place the cans on the wire shelves and the sizes and shapes. You can use the Igloo Beverage Coolers at home, in the office, in your garage, dorm room, in your store or wherever you need it or see convenient. The double pane glass door increases the energy efficiency and is nice to have for you to see the contents of the fridge without needing to open the door. It has a sleek and modern design with the black cabinet and the stainless steel trim to fit any decor nicely. You can reverse this stainless steel door to open from the left or right to fit it better in any space. With the thermostat that can be adjusted via the small LED-backlit display panel, you can have cool temperatures between 32 and 50 degrees Fahrenheit. You have the bright white LED light inside that illuminates your cans and bottles on the four adjustable black wire racks. We can’t see a lock on the door and is not mentioned on the specs. The Igloo IBC35SS weighs 75 pounds and measures 18.5 x 21.6 x 33.3 inches for an ample 3.5 cubic feet interior capacity for your soda and beers cans, wine bottles and more. 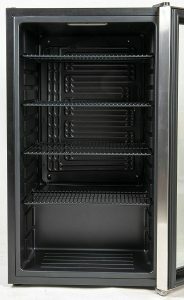 You can use it both as a built-in and stand alone cooler with its modern and beautiful appearance. You just need some clearance on the sides and the rear. It offers flexible shelving and storage and you can put in a variety of cans and bottles with different shapes on the adjustable wire shelves. These pull-out shelves slide out easily and smoothly for you to reach the cans or bottles at the back of the fridge. The Igloo Coolers do the job very well, cool your cans and bottles efficiently, judging by the customers’ comments. And it runs very quietly as compared to some other beverage coolers and wine” cellars. A lot of the cool air is kept inside with the double paned glass stainless steel door and doesn’t do a lot of cycles. And even when it does its cycles you can hardly hear anything. Customers reported not seeing any frost even after several weeks of use at very low temperatures and loaded at full capacity. Overall they are great value for the dollar.